Easy pattern and supplies to weave 3 Melon Baskets. 1/4" flat, #6 round w/ 6", 8" and 10" hoops. Weaves 6", 8" and 10" diameter baskets. Adult Beginner Level. 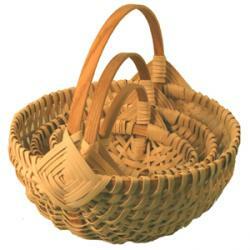 SKILLS LEARNED: Rib basket construction (also called melon or egg basket), plain-weave with flat reed.